Rocky Butte jasper is very solid hard jasper. It has a an incredible variation in colors and patterns. Some is dendritic, some has a landscape quality to it and some has several colors in one stone. 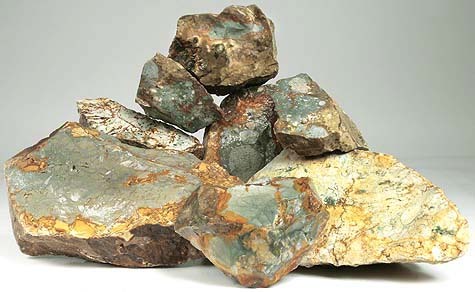 Rocky Butte Jasper polishes with diamond, cerium or tin oxide. Mohs hardness 7. 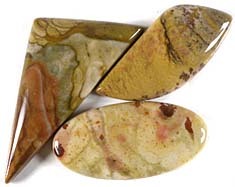 Rocky Butte Jasper#12 Triangular shape measures approximately 5" x 4" x 3 to 1/2" thick. Blue background with brown landscape patterns. Rocky Butte Jasper#15 Triangular shape measures approximately 4" x 2" x 1-3/4" thick. Nice slabber with blue, golds, reds and browns.